NASA’S Curiosity has the fastest modem on Mars. Since its only competition is an oldish bit of kit aboard Opportunity, one of two rovers dispatched in 2003, that is not saying much, at least in terms of what internet users on Earth have learned to expect.Curiosity‘s ability to capture images and other data easily outstrips its capacity to beam it all back home. Nonetheless, it delivers vastly more information from the red planet than any previous mission did. The rover makes use of two separate radio systems. One is dedicated to Direct-to-Earth (DTE) transmissions and uses frequencies of 7-8 gigahertz (GHz). Michael Watkins, mission manager for Curiosity (formally, the Mars Science Laboratory) at NASA’s Jet Propulsion Laboratory (JPL), explains that this system has extremely low capacity and is designed for receiving (and sometimes acknowledging) terse instructions to carry out a day’s tasks. A separate system allows the rover to connect to one of two American satellites in orbit around Mars twice each Martian day, or sol, to relay the scientific data back to Earth. The DTE system relies on two relatively small antennae and a modest amplifier. These use little power and should keep ticking along even when Curiosity‘s additional rechargeable batteries—which, like its main, nuclear one, are built to last for at least 668 sols, or one Martian year (23 Earth months)—begin failing. To establish a link, the rover needs a line of sight to Earth, where the Deep Space Network, a linked array of enormous radio dishes (see picture) spread around the world, can communicate continuously from all space probes scientists are currently tracking. In the first two sols or so Curiosity had to rely on its weaker antenna (a “low-gain” one), which can pick up signals painted across most of Mars by Earth’s transmitters, but which has a low bit rate: tens of bits per second. The rate meant JPL could send only short sequences of commands during the window of a sol when the rover could receive data. That reduces the complexity of a day’s mission. At least the rover received signals reliably. After that initial period, the JPL had enough information in hand to turn on a “high-gain” antenna on the rover. Such an antenna receives radio signals from a much narrower area, and both Earth and the rover have to point their antennae much more precisely towards each other. With this antenna pointed correctly, the data climbs to a few kilobits per second (Kbps), about as fast as the last generation of earthly dial-up modems, “plenty enough” to send commands, according to Dr Watkins. Justin Maki, responsible, among other things, for Curiosity‘s 17 cameras, says that the rover takes a picture of the sun in order to compute the relative position of Earth for a few hours into the future and adjust the antenna accordingly. The rover also sports inertial navigation, combining accelerometers and gyroscopes for noting movements, to compute its position relative to a known starting location. That inertial information allows the rover, when it moves about Gale Crater in the future, to adjust the antenna relative to where it thinks Earth is, maintaining the DTE connection. And, should the high-gain fix be lost, Curiosity can still listen to its slower, low-gain antenna. 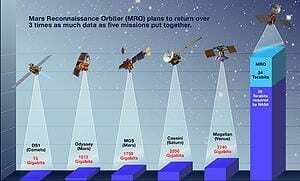 From its first transmissions in 2005, MRO has sent back a stunning 174 terabytes of data, more than all previous planetary missions and probes of any kind combined. BothOdyssey and MRO can ship Curiosity‘s transmissions off live, or store them and send them off whenever is optimal, typically within several hours of receiving them. Curiosityhas a lower throughput than the MRO‘s top rate at the moment, beaming data from the surface at rates of up to 1 Mbps as of today after several days of testing at a fixed 256 Kbps. As the first rover with an adaptive-rate transmitter it will ultimately change data rates as needed to ensure reception. JPL plans to test that over time, and should be able to ramp up to a maximum of 2Mbps during parts of each eight-minute fly-by.